Sony has created a very interesting dSLR model and the A500 is likely to appeal to a variety of photographers looking for a unique camera with the ability to perform well in a wide range of conditions, thanks to it's excellent performance for a camera at this price point, With features that a more experienced photographer or a first time dSLR owner can appreciate. Read Steve's Conclusion to see our complete thoughts on the A500. 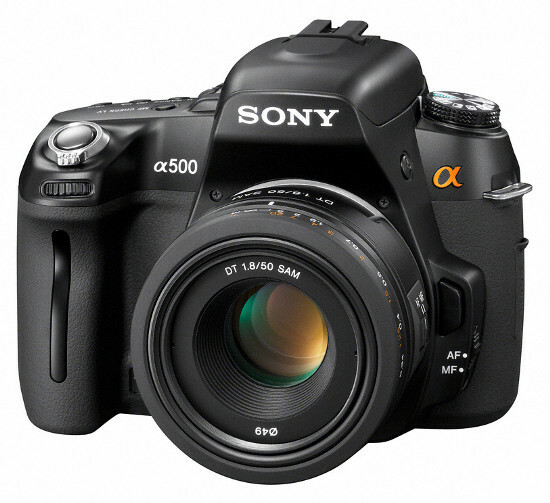 Sony starts off their line-up of new DSLR cameras with the Alpha-500. the a500 boasts Sony's new 12.3-megapixel Exmor CMOS sensor and the BIONZ image processor to improve the ease of shooting and get clearer images. Also new to the Sony DSLR line is the in-camera High Dynamic Range feature. This option will help bring out details commonly lost in shadows and evens out backlit subjects. Sony has also improved their Live View by using two sensors to maintain focus speed. The Quick AF Live view has been developed with Face Detection technology, and is the worlds first face detection system to work with fast, high-precision "phase detection" auto focus. Smile Shutter technology debuts for the first time in a dSLR in the a500 as well. Just like with Cyber-Shot models, Smile Shutter will take a picture when it detects that your subject is smiling. The a500 uses the Memory Stick Pro Duo, SD and SDHC memory cards and is also compatible with Son's new 32GB Memory Stick PRO-Duo HX card. The DSLR-A500 is available in several different ways, you can purchase just the camera body (DSLR-A500 MSRP$749.99) or a body and lens kit like we tested. The kit configuration includes the SAL1855 SAM DT Lens (DSLR-A500L MSRP $849.99). SAN DIEGO, Aug. 27, 2009 - Sony today introduced two α (alpha) DSLR cameras with a new generation of Exmor™ CMOS sensors and BIONZ™ image processors, which make it easy for active shooters to get the best shot and capture clearer images--without missing their favorite moments. The α550 (14.2 megapixels) and α500 (12.3 megapixels) cameras provide excellent picture quality, particularly in low-light scenarios. A new generation of Sony® Exmor CMOS image sensors employ new low-noise processing for high-quality pictures. The BIONZ image processor has color-noise reduction that helps achieve low noise up to ISO 12800, without sacrificing fine detail. "We are bringing performance of a higher class of cameras within the reach of a broader group of consumers," said Mark Weir, senior manager of the Digital Imaging business at Sony Electronics. "Not only do these cameras provide great value, but they also bring faster shooting speeds and new technologies like in-camera High Dynamic Range and new Live View features to mainstream photo enthusiasts." With its unique sensor-processor combination, the α550 camera is the first DSLR in its class with seven frames per second shooting speed for under $1,000. Using the optical viewfinder on both models, you can shoot up to five frames per second and up to four frames per second with Quick Auto Focus Live View. This helps you capture the decisive moment when shooting fast moving subjects like in sports. These are Sony's first DSLR cameras that offer an in-camera High Dynamic Range (HDR) feature for capturing highlights and shadows, which processes the image within two seconds. Unlike HDR features in other DSLR cameras, Sony's unique positional interpolation technology can overcome slight changes in camera position and align individual shots so that a tripod is not required. The feature handles severe backlighting and other high-contrast scenes like looking out a window into bright daylight. The in-camera auto HDR technology combines the highlight and shadow detail of two separate captures into one remarkably natural looking image. Because composing shots on the LCD monitor is becoming increasingly important to DSLR users, Sony has equipped these cameras with two Live View functions and a 3-inch (measured diagonally) LCD screen that tilts 90 degrees up or down. The α500 has a 230,000 pixel Clear Photo LCD Plus™ screen, and the α550 has a 921,000 pixel Xtra Fine LCD™ display. Sony's Quick AF Live View uses two sensors to maintain the same focusing speed as with the optical viewfinder. While the speed of Quick AF Live View is ideal for every day shooting, Manual Focus Check Live View enables critical framing and magnification for setting precise manual focus in macro and tripod shooting. Temporary 7x and 14x zoom views enable you to focus on extremely fine detail while the 1x view shows 100 percent framing in the LCD. The Quick Auto Focus Live View has been developed with Face Detection technology to help you get the best shot by recognizing and adjusting for faces. It is the world's first Face Detection system to work with fast, high-precision "phase detection" Auto Focus. By tracking up to eight faces, this system can prioritize auto focus points on a face, and optimize exposure and white balance for beautiful portraits. These are Sony's first DSLR cameras that include Smile ShutterTM technology in Live View, which takes the shot when your subject smiles. It works with Quick Auto Focus Live View to capture spontaneous moments. Image stabilization helps take blur-free shots by compensating for camera shake. Typical DSLR systems build image stabilization into selected lenses only. SteadyShot INSIDE™ image stabilization is built into the camera body itself. Blur will also be reduced with every A-mount lens, including macro and wide aperture standard zoom lenses, with an effect equivalent to shutter speeds faster by 2.5 to 4 stops. To make the benefits of macro photography easier and more accessible, Sony is making available at retail the DT 30mm F/2.8 (model SAL30M28) macro lens. It captures intricate close-ups, which is difficult to achieve with standard lenses and is only compatible with APS-C format DSLRs. For higher capacity storage with greater connectivity and faster transfer speeds, the new DSLRs are compatible with Sony's newest 32GB Memory Stick PRO-HG Duo™ HX media. The HX series card is designed to deliver optimal read and write speeds for a growing number of products that require high-bandwidth memory in order to capture and store large data files. Using the HX series media, Sony α (alpha) DSLR users can confidently enjoy advanced features such as continuous-shooting photography and realize higher transfer rates of large capacity files to their compatible PC (via supplied USB adapter). For example with the α550 model, approximately 1500 14-megapixel photos shot in the JPEG+RAW mode can be transferred to a compatible PC in approximately 26 minutes (HX series media sold separately). The new cameras include dedicated slots for high-capacity Memory Stick PRO Duo™, Memory Stick PRO-HG Duo™, HX series and SD/SDHC media (all sold separately). The α550 (model DSLR-A550) and α500 (model DSLR-A500), which come with the camera body only, will cost about $950 and $750 respectively. The α550L and α500L, which come with the camera body and 18-55 kit lens, will cost about $1050 and $850, respectively. The SAL30M28 macro lens will be available for about $200. The cameras, lens and a range of accessories will be available in October at Sony Style® retail stores (www.sonystyle.com/retail), at military base exchanges and at authorized dealers nationwide.